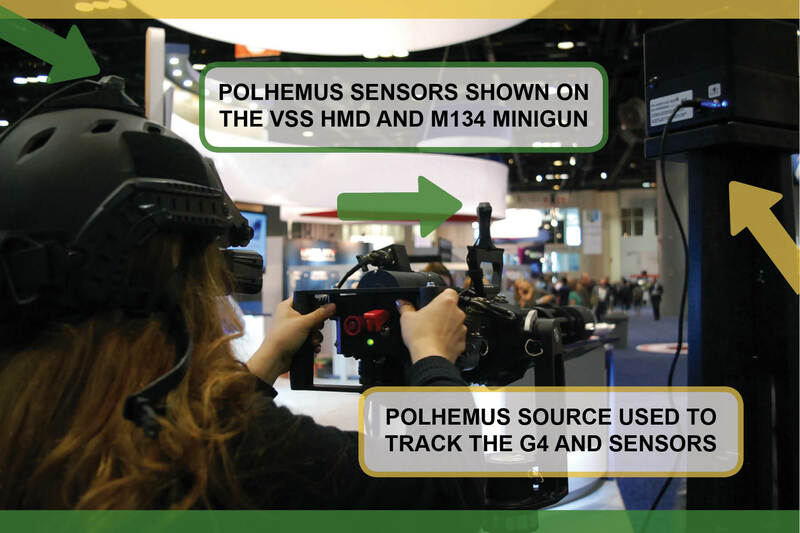 In the virtual environment, the Simulated M134 Minigun training system is set up with the Polhemus G4™ motion tracking system. Because the tracking system is true 6DOF, the sensor tracks both the position and orientation of an object. When it comes to finding ways to save money on military training, operations that use heavy ammunition are among the top of the list. VSS (Virtual Simulation Systems), out of Australia, developed the Simulated M134 Minigun. It’s a full-size replica of the original M134, made to deliver the most realistic training experience possible, while enabling a significant cost savings for military groups (Polhemus sensor shown on top of the VSS M134 Minigun). The actual live weapon, the Original M134, is a high powered, six-barrel machine gun. Featuring a Gatling-style rotating barrel, this powerful military weapon can shoot rounds of ammunition at a high rate, with a rate of fire up to 6000 rounds per minute. This volume of ammunition is extremely costly for each training exercise. Used with the Polhemus G4, the Simulated M134 Minigun significantly cuts costs by not firing live rounds, yet provides the various scenarios in a virtual environment to prepare trainees for live operations. Besides learning how to lead their firing, trainees also learn the skills necessary to lead the target, which isn’t always intuitive, and takes practice. They also learn how to react in various situations, including maintaining safety precautions, and what to do in case there are equipment malfunctions in a live operation. The Simulated M134 is an accurate depiction of the live weapon with all of its functioning parts and if any critical part of the weapon is disabled in any way or removed, the weapon will not allow the trainee to fire. With features such as force feedback during fire and dry firing with high frequency vibration module, trainees get a fully simulated experience. Originally targeted for use by the U.S. Army, the live mini gun can be mounted on humvees, but is primarily used on helicopters. 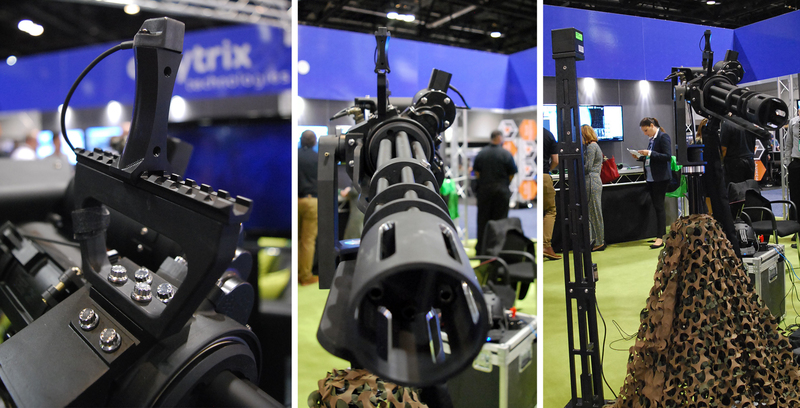 In the virtual environment, the Simulated M134 Minigun training system is set up with the Polhemus G4™ motion tracking system. Because the tracking system is true 6DOF, the sensor tracks both the position and orientation of an object. In this case, a sensor is attached to the gun and a second sensor is attached to the HMD equipped helmet. Viewing the virtual scenario through the HMD, the trainee’s head movement is tracked, along with the gun movement. Besides saving on ammunition costs, another cost benefit with simulated training is the aircraft never leaves the ground; this saves on fuel and aircraft maintenance, as well as the travel costs involved with sending an entire training crew for a training mission. With less time in the air, there are also environmental benefits. The M134 is available with composite plastics or metal construction. It is available to system integrators or as a full stand-alone simulated training solution by VSS. VSS (Virtual Simulation Systems) is a groundbreaking company, developing new and custom solutions for both military and civilian simulation needs. They offer an innovative range of products in the synthetic training realm and are constantly developing new technologies to meet cost-effective outcomes. VSS designs and builds custom simulators, full procedural or part task trainers to suit any needs at any budget. These range from vehicles to aircraft, projection domes to virtual displays and more. They offer Commercial off the shelf simulators that are modular and can be combined or customized in many ways.